All New Landscape MapsTM National Forest land ownership (private in-holdings) are shown in addition to forest boundaries Updated road conditions compiled from annual Motor-Vehicle Use (MVU) data by US Forest Service BLM/State land ownership Page to page map overlap, clear legibility Recreation Guide Public Lands maps are completely updated with recreation access and point-to-point mileages Recreation listings are current and fact-checked Categorized listings include: Parks, Monuments, Natural Wonders Campgrounds & RV Parks Boating & Fishing Access Forest & Wildlife Areas Hunting Unit Map with Info Resources The Grand Canyon State abounds in natural beauty and outdoor possibilities. With completely reworked Landscape Maps and a comprehensive Recreation Guide, Benchmark's Arizona Road and Recreation Atlas is an invaluable resource for adventure planning and exploration. The regional Recreation Guides show public land access and categorized points of interest with descriptions and details found in no other map product. Landscape Maps provide the largest scale and 54 pages of highly detailed road classifications and conditions. The base layers show land cover (vegetation) and land ownership including private in-holdings within national forest boundaries. Combining a comprehensive road map with a convenient travel guide, National Geographic's Arizona Guide Map is an essential travel companion for all visitors. The main map's road network is complemented by a user friendly index of counties, cities and towns. Clear designations are given for free access and toll roads; interstate, state and country routes; paved and unpaved roads; and scenic byways. Major highways are shown with mileage markers and roadside rest areas. Points of interest, national and state public recreation areas, airports, hospitals, ski areas and visitor centers are all pinpointed. 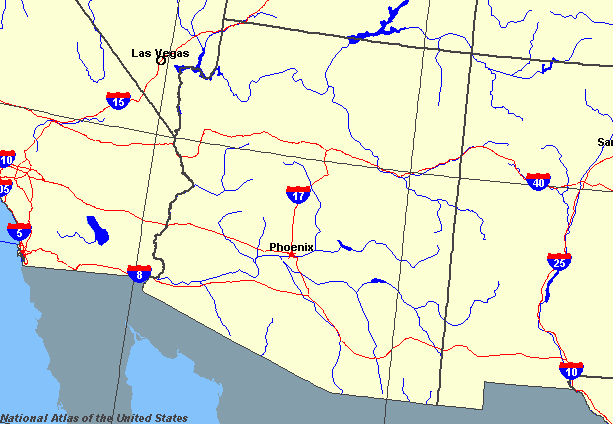 Detailed inset maps show the Phoenix metropolitan area, Downtown Phoenix, Tuscon, Flagstaff, Yuma, and Bullhead City/Laughlin, in addition to Saguaro and Petrified Forest National Parks. A travel guide to Grand Canyon National Park, complete with map and contact information, is also provided along with a chart showing the available services in the state's abundant national parks. A calendar of events and points of interest guide describe and provide contact information for many of the most popular attractions. The durable and convenient Arizona EasyToFold state map will take all the wear and tear your journey can dish out. The heavy-duty laminated design allows you to mark your route, make notes, then wipe the surface clean for further use. This is a must-have for navigation whether you're a state resident or just passing through. Rand McNally's Easy To Read State Folded Map is a must-have for anyone traveling in and around Arizona, offering unbeatable accuracy and reliability at a great price. Our trusted cartography shows all Interstate, U.S., state, and county highways, along with clearly indicated parks, points of interest, airports, county boundaries, and streets. New, Compact Size for 2017! 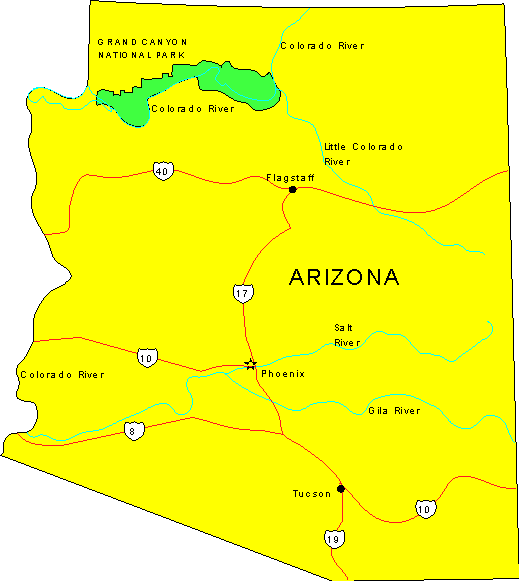 Phoenix Mapping Service Arizona Highways and Roads Small Wall Map, Gloss Laminated is a State of Arizona color wall map detailing highways and roads in a small 24" × 30" size. This detailed and up-to-date gloss laminated wall map shows all of the interstate, state, and tribal highway systems of Arizona and is ready for erasable markers. Also included are cities and towns with relevant population information; townships by township and range grid; rivers, streams, lakes, and mountain ranges; counties, and Native American tribal lands, military reservations, wilderness areas, wildlife refuges, and National Parks, Forests, and Monuments. Gloss Lamination features premium optically clear film which provides a high shine for dramatic color presentation. The gloss laminated map is a convenient and useful at-a-glance reference ready for wet erase or alcohol erase markers, sticker dots or arrows, or graphic tape. Satellite Photo of Arizona is a raised relief map which offers satellite photographic detail but uses colors appropriate to the natural terrain of the state. Hubbard Scientific is the largest manufacturer of Raised Relief Maps in the United States. We begin with a flat map printed on sturdy vinyl. We then construct a terrain model using digital elevation data from the USGS and other sources. The vinyl map is carefully registered with the terrain mold. Once the registration of the map is complete, it is vacuum formed over the terrain model. The result is a truly exceptional visual and tactile reference. You will be proud to display one of our raised relief maps in any setting. Phoenix Mapping Service Arizona Counties and Roads Large Wall Map Dry Erase Laminated is a State of Arizona dry erase laminated color wall map detailing counties and roads in a large 47" x 60" size. This detailed and up-to-date State of Arizona wall map defines counties with pastel coloring and is ready for dry erase markers. Also included are cities and towns with relevant population information; all of the interstate, state, and tribal highways systems; rivers, streams, and lakes; mountain ranges; tribal lands, military reservations, wilderness areas, and wildlife refuges; and National Parks, Forests, and Monuments. Dry erase laminated, one-sided wall map. Sheet Size = 33" x 40.5"
This is an ALL-NEW, full-color second edition. The new book is spiral bound with a thick, durable cover. It's been expanded to 100 trails, including 43 new trails not in the previous edition. Whether you're a newcomer to 4-wheeling or an experienced veteran, we guarantee you'll have fun. 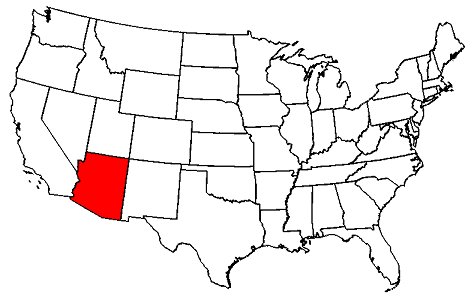 Trails include desert and mountain areas, many close to Phoenix, Tucson and Flagstaff. In addition, we've added more trails around stunning Sedona. Featured new trails in other parts of Arizona include Canyon de Chelly, Monument Valley and El Camino del Diablo. Easy, moderate and difficult routes are color coded, while symbols quickly show kinds of vehicles allowed on each trail. This includes unlicensed UTVs, ATVs and dirt bikes. A separate mileage log ties numbered locations along the route to a custom map featuring a detailed relief background. GPS coordinates are built into the mileage log so you no longer need to flip to the back of the book. Every trail is layed out in a convenient two-page spread with directions right next to the map. Included are reverse mileages for all trails and more historical highlights. A free PDF sample of the book can be downloaded from the publishers Website at FunTreks.com. Please note that the previous black & white edition is now out of print.